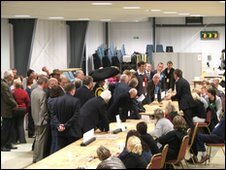 The Conservatives have taken Derbyshire's Amber Valley constituency after a second recount. Judy Mallaber was defending the seat for Labour but Conservative Nigel Mills led by 600 votes in the original count and finally secured a 536 majority. The result - which represented a 6.9% swing - was one of the last in the election to be declared. The delayed count was partly blamed on the number of postal votes, with about 9,000 delivered to polling stations. Judy Mallaber won the seat in 2005 and has held it since 1997. In other Derbyshire seats, the Conservatives gained three with Andrew Bingham taking High Peak, Heather Wheeler winning Derbyshire South and Jessica Lee taking Erewash. Labour candidate Toby Perkins won Chesterfield from the Liberal Democrats' Paul Holmes.